There's a lot of perks to being a world-renowned British spy from the 1960s... like a swinging lifestyle, awesome weapons, Judo training, and sweet cars. But for some reason, a dental plan doesn't seem to be covered in the benefits (maybe spy-teeth are just too risky to insure -- they do take a lot of punches). In the world of espionage, though, they've become a trademark. In fact, having a perfect set of choppers would legally disqualify you from being a retro British spy. 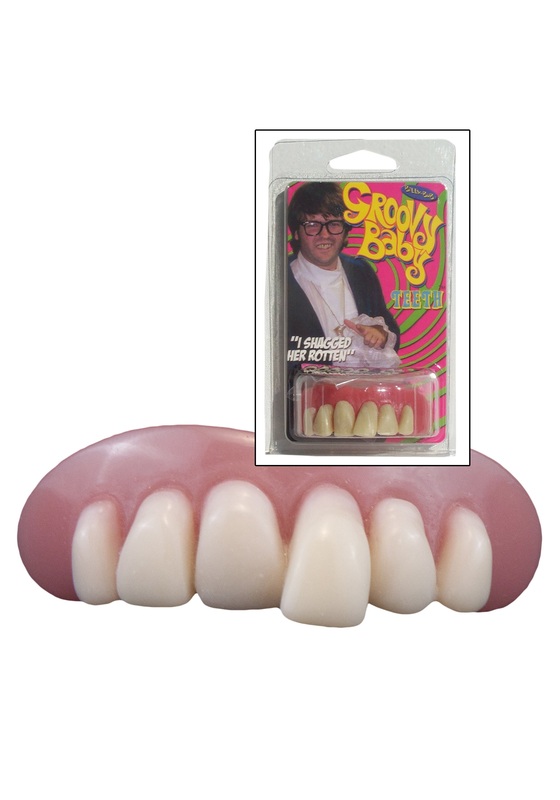 So if you're going undercover as the UK's top secret agent this Halloween and you don't want to blow the mission, make sure you've got these Groovy Baby Teeth! This easy-to-use dental accessory molds to your own teeth thanks to a special adhesive, and once the mold takes shape, it fits you -- and only you. It's an accessory you can really sink your teeth into (sorry, we couldn't resist) -- and the perfect finishing touch to your awesome British secret agent costume!